This week Newton's Nook Designs and Chibitronics are partnering for a fabulous inspiration week! All week long both design teams will be sharing ways to light up your cards using Chibi lights with Newton's Nook Designs stamps! There are prizes too! Read all the way to the end of this post to find out how you can win! Today we are featuring projects by Ellen and Naki! 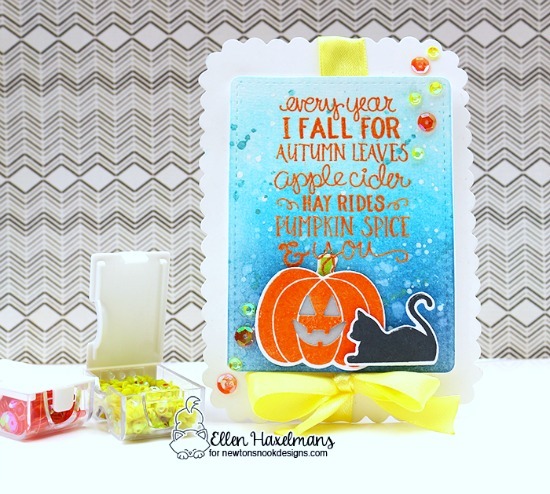 Ellen used the Chibitronics Starter Kit along with several NND stamp sets to create this adorable Halloween project! She used the fun big sentiment from the Fall-ing For You Stamp Set embossed in orange along with some fun distress inks for her background. Then she added on the cute little pumpkin from the Pick-a-Pumpkin Stamp Set with a jack-o-lantern face trimmed out using the Pick-a-Pumpkin Die Set! The inside of the face lights up when you press on the card! So cool! She even added in a sweet black cat silhouette using the kitty from our Furr-ever Friends Stamp set! Ellen has a second project on her blog today so pop over there to check that out too! You can visit Ellen's blog: Crafty Ellen to see more and leave a comment for another chance to win! 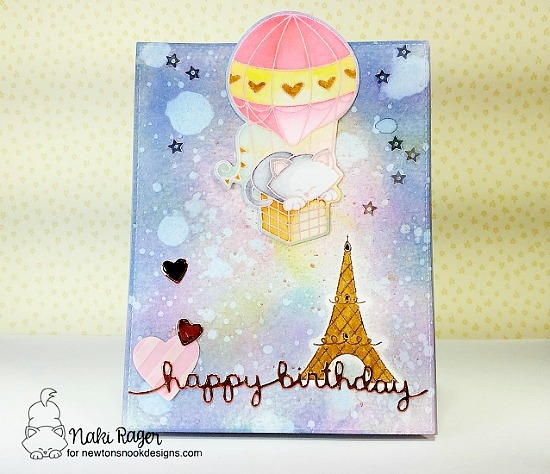 Naki created this lovely Paris scene using our Newton Dreams of Paris Stamp Set along with the Chibitronics Starter Kit! She started by stamping the Eiffel Tower and creating beautiful background created with distress inks. Then she added the kitty in the hot air balloon, also from the Newton Dreams of Paris Stamp Set floating over the sky. She configured her chibi lights so that when you press on the card front the Eiffel Tower lights up! WOW! So dreamy! Visit Naki's blog: Notes from Naki to see more and leave a comment for another chance to win! The creativity is amazing. These cards are wonderful. This collaboration is so awesome! I love these cards! I mean, a glowing jack-o-lantern and an Eiffel Tower that lights up?! I'm in heaven! 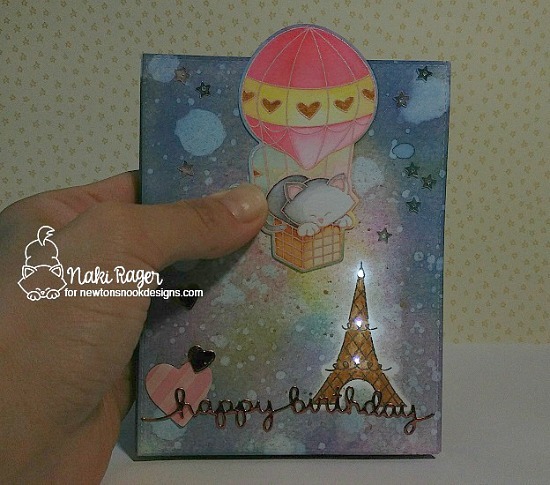 More fabulous light up cards with Newtons Nook stamps. The perfect Jack O'Lantern, love it! And I've never seen the Eiffel Tower, but I'm pretty sure it lights up, too; very pretty! Another great group of cards for these wonderful lights. Such awesome cards! Really enjoying your collaboration week with these extra special cards! Great cards. Love the lights such an awesome way to make the cards come to life. Such awesome projects. Can't wait to try making light up cards! Two great cards! These light kits look like so much fun! The Eiffel Tower with lights, just like the real one ! These are SO fun! Both cards are gorgeous, and the light shows they feature are incredible! Lovely cards. I especially like the light up pumpkin! These are simply amazing! What fantastic ideas and such a great design! Love both beautiful cards! So creative! The cards are wonderful. Some fabulous cards again!! The more I see of these lights the more I love them. They just bring the card to life!! Adorable, adorable! I just love all these images. These are SO creative! I love that the Eiffel tower lights up!! Super cute cards. I've been afraid to try the chibitronics,but I can see what cute cards they make.